"Air War Pacific Chronology: America's Air War Against Japan in East Asia and the Pacific 1941-1945"
"USAAF Chronology: Combat Chronology of the US Army Air Forces"
by Jack McKillop (Piscataway, NJ). Also on line at Rutgers University. I later discovered a resume listing all of the 20th Air Force (and 21st Bomber Command) missions. It is a large file (about 42 Mb) and may be found here. I obtained the file from the Scribd website. The mission numbers listed were the XXI Bomber Command and 20th Air Force Bombing Mission numbers. Below that is the chronological number of the mission as flown by the 315th Bomb Wing against the empire. These 315th missions are summarized in Adobe pdf files that may be accessed through the link. Some of these XXI Bomber Command and 20th Air Force mission summaries contain other wing missions as well as mission summaries for the 315th. You will need to reference the XXI Bomber Command and 20th Air Force Bombing Mission numbers for the individual 315th mission. These mission files are large and will take a long while to load. You may also right click on the link and download the file to your computer. Type of Bombs and Fuzes: AN-M64, 500#, G.P., 1/40 sec. delay nose and non-delay tail. Tons of Bombs Dropped: 222.8 tons on Primary and 6.7 tons on Opportunity. Resumé of Mission: Two strings of bombs were in the target within a 2000-foot radius and 3 strings approximately 7,500 feet WNW of aiming point and 1 string approximately 9,000 feet NNW of aiming point. Thirty A/C bombed by radar and 3 visually. One A/C was non-effective. Flak was heavy, nil to meager, and generally inaccurate. Twenty-nine ineffective S/L's observed in target area. One A/C landed at Iwo Jima. No E/A were sighted. Average bomb load: 14,631 lbs. Average fuel reserve: 1320 gallons. (Mission 232) During the night of 26-27 June, 33 B-29's from the 16th BG, in their first mission, attack the Utsube Oil refinery at Yokkaichi; one B-29 hits an alternate target. The Guam based 502nd BG makes it's first combat mission to the bypassed Japanese base at Rota Island. Type of Bombs and Fuses: M64, 500# G.P., 1/10 sec. delay nose and 1/100 sec. delay tail. Resumé of Mission: Results were unobserved. All bombing was by radar. Flak was heavy, meager and inaccurate. Several S/L's were observed in the target area. Four A/C were non-effective. No E/A were observed. Average bomb load: 14,647 lbs. Average fuel reserve: 1,181 gallons. (Mission 238) Thirty-two 315th BW B-29's drop 209 tons of bombs on the Nippon Oil Company refinery at Kudamatsu. Resumé of Mission: During the night of 2-3 Jul, 39 315th BW B-29's bomb the Maruzen Oil Refinery at Minoshima; one B-29 bombs an alternate target. Resumé of Mission: Photo reconnaissance on 11 July revealed that 95% of the plant had been destroyed. Fifty-eight A/C bombed by radar and 1 visually. Seventeen E/A were reported. Two ramming attempts were reported. Flak was heavy, meager to nil and inaccurate. One balloon was sighted at 11,500 feet. Average bomb load: 16,071 lbs. Average fuel reserve: 1,386 gallons. (Mission 255) Fifty-nine B-29's dispatched from the 315th BW drop 500lb on the Maruzen Oil Refinery at Wakayama; one B-29 hits an alternate target. MEAN TIME OF PHOTOGRAPHY: 2320Z ALTITUDE: 30,000 FT.
BOM COM MISSION 255, 6-7 JULY 1945. Resumé of Mission: Photo reconnaissance showed 20% of the target had been damaged or destroyed. The target was visible to 10 A/C. Two A/C were non-effective. Fifteen E/A sighted made 2 attacks. One B-29, hit by a 20mm shell, suffered minor damage. Flak was heavy, nil to meager, inaccurate to accurate and predict- ed concentration. Twenty S/L's observed, some radar controlled/ Two A/C landed at Iwo Jima. Average bomb load: 16,811 lbs. Average fuel reserve: 1,233 gallons. (Mission 261) Sixty-one B-29's dispatched from the 315th BW attack the Utsube Oil Refinery at Yokkaichi with poor results; one B-29 hits an alternate target. Resumé of Mission: Radar scope photos indicated fair results. Only 3 A/C sighted target. Six B-29's were non-effective. Thirty-eight E/A sighted made 2 attacks. No claims. Flak was heavy, meager and inaccurate. S/L's ineffective because of cloud cover. One crew bailed out en route to target between Guam and Tinian. Nine survivors. One B-29 was missing to unknown reasons. Average bomb load: 18,226 lbs. Average fuel reserve: 1,175 gallons. (Mission 267) Fifty-three B-29's dispatched from the 315th BW attack the Kawasaki Petroleum Complex destroying about 25% of the target. Resumé of Mission: Results were unobserved. A/C bombed by radar and 7 visually. Seven A/C were non-effective.Thirty-two E/A sighted made no attacks. Flak was heavy, nil to meager, and in- accurate. Estimated 10-13 S/L's, generally ineffective, observed in target area. Two wind-run A/C also airborne and bombed their primary target, Ube Coal Liquefaction Co. Five B-29s landed at Iwo Jima. Average bomb load: 17,806 lbs. Average fuel reserve: 1,066 gallons. (Mission 270) Fifty-nine B-29's dispatched from the 315th BW bomb the Nippon Oil Company at Kudamatsu and the facility is almost completely destroyed; three B-29's attack alternate targets. Resumé of Mission: Scope photos indicated excellent results. In spite of the fact that 7 A/C did not identify the proper target, the remainder created a comparative solid bomb pattern. Twelve of 14 buildings of the synthetic oil plant damaged and only 3 small tanks left undamaged. Only 2 of 10 large tanks on the tank farm remained undamaged. Flak was heavy, meager and inaccurate. Fifteen E/A sighted did not attack. Intense S/L activity in the target area. One A/C was non-effective. All bombing was by radar. Two Wind-Run A/C preceded main force. One B-29 landed at Iwo Jima. Average bomb load: 17,832 lbs. Average fuel reserve: 999 gallons. (Mission 281) Eighty-three B-29's dispatched from the 315th BW bomb the Nippon Oil complex at Amagasaki; one B-29 hits an alternate target. Resumé of Mission: Clouds prevented any observations of bombing results. Five bombed visually and 67 by radar. Four A/C were non-effective. One E/A flew a parallel course out of range, blinking lights, probably A/A altitude and course spotter. No E/A. Flak was medium, meager and inaccurate. Searchlight activity was meager and generally ineffective from Shimonoseki area and coast of Kyushu. Two Wind-Run A/C were airborne and bombed Nippon Oil Refinery with fragmentation bombs. Eight B-29s landed at Iwo Jima. Average bomb load: 18,656 lbs. Average fuel reserve: 879 gallons. (Mission 283) Seventy-two 315th BW B-29's bomb the coal liquefaction plant at the Imperial Fuel Industry Company at Ube. Tons of Bombs Dropped: 650 tons on Primary, 9 tons on Target of Opportunity and 18 tons by Wind-Run A/C. Resumé of Mission: Photo reconnaissance showed 32% of storage tank units, and 1 furnace, 1 asphalt loading unit, 1 can manufacturing plant and 2 warehouses of the Mitsubishi Oil Refinery (90.17 - 116) was destroyed and 36% of the storage tanks, 5 U/I buildings, 7 probable office buildings, and 4 maintenance sheds of Hayama Petroleum Co. (90.17 - 127) was destroyed. Targets were visible to only 3 A/C. Flak was heavy caliber, moderate to intense, accurate to inaccurate. Intense S/L activity was encountered and rope was used with varying success. Two Wind-Run A/C bombed Shimizu Aluminum Plant at Shimizu. Seven A/C were non-effective. Three B-29s landed at Iwo Jima. The aircraft that was lost suffered a direct flak hit over the target. No E/A. Average bomb load: 18,664 lbs. Average fuel reserve: 1,109 gallons. (Mission 291) Seventy-five 315th BW B-29's attack the Mitsubishi Oil Company and Hayama Petroleum Company at Kawasaki destroying 33% of the storage tanks and other facilities; one B-29 attacks an alternate target. One B-29 suffers a direct flak hit of the target and goes down. Coned by searchlights and shot down by flak on approach to target. Aircraft crashed into the Nippon Casting Company factory at No. 3, 2 chome, Shiraishi-cho, Kawasaki. Resumé of Mission: Bombing results were unobserved. All bombing was by radar. Five A/C were non-effective. Twelve E/A sighted made no attacks. Flak was heavy, meager, inaccurate to accurate. One B-29 was damaged by flak. Two Wind-Run A/C were A/B. Two A/C that bombed Primary also bombed Opportunity. Two B-29s landed at Iwo Jima. Average bomb load: 18,375 lbs. Average fuel reserve: 1,145 gallons. 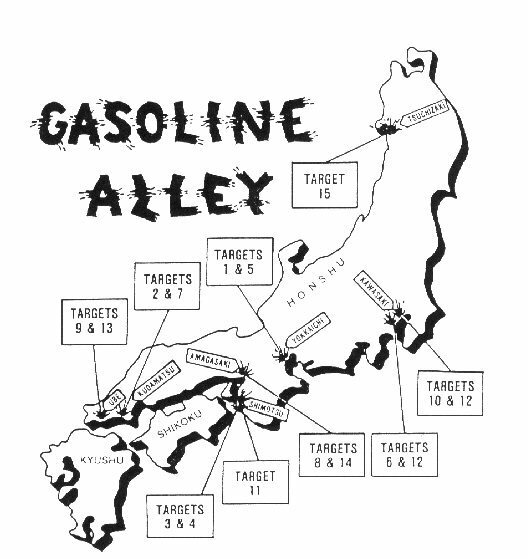 (Mission 303) Seventy-six 315th BW B-29's bomb the Shimotsu Oil Refinery; 75% of the tank capacity, 90% of the gasometer capacity and 69% of the roof area are destroyed or damaged; one B-29 hits an alternate target. Type of Bombs and Fuzes: M64, 500# G.P. bombs fuzed with 1/10 sec. delay nose and 1/40 sec. delay tail. Tons of Bombs Dropped: 1,017.3 tons on Primary and 26 tons on Opportunity. 116 - Mitsubishi Oil Refinery - 41% of storage tank capacity destroyed. 127 - Hayama Petroleum Center - 43% of storage tank capacity and 35% of intermediate tank capacity destroyed. 128 - Kawasaki Petroleum Center - 35% of storage capacity and 15% intermediate tank capacity destroyed. Six A/C were non-effective. Flak was heavy, medium, meager to intense and accurate. Flak damaged 22 A/C. Thirty to 35 E/A made 9 attacks. No claims. One Wind-Run A/C is not included in the above total. Six A/C bombed visually and 114 bombed by radar. Seven B-29s landed at Iwo Jima. Average bomb load: 18,410 lbs. Average fuel reserve: 1,039 gallons. (Mission 310) One hundred twenty 315th BW B-29's bomb the Mitsubishi Oil Company at Kawasaki but could only add slightly to the damage previously inflicted; two B-29's hit targets of opportunity. Type of Bombs and Fuzes: M64, 500# G.P. bombs with 1/10 sec. delay nose and 1/100 sec. delay tail. Tons of Bombs Dropped: 938 tons on Primary and 22.5 tons on Opportunity. Resumé of Mission: 100% of refinery units and 80% of the stores and work shops damaged or destroyed. Also the Ube Iron Works Co. ( 90.32 - 1878 ) was 50% damaged or destroyed. Three A/C were non-effective. Only 2 A/C made visual sightings. Flak was heavy, meager and inaccurate. 25 to 35 E/A were sighted and made 1 attack. Two Wind-Run A/C took part in the mission and bombed with main force. They are not indicated in the total A/B. Five B-29s landed on Iwo Jima. Average bomb load: 18,704 lbs. Average fuel reserve: 969 gallons. (Mission 315) One hundred six 315th BW B-29's bomb the Ube Coal Liquefaction Company facility at Ube destroying 100% of the refining units and destroying or damaging 80% of other structures; 2 B-29's hit alternate targets. Type of Bombs and Fuzes: M64, 500# G.P. bombs with 1/10 sec. delay nose and non-delay tail. Tons of Bombs Dropped: 902 tons on Primary, 16 tons by Wind-Run and 22.3 tons on Opportunity. Resumé of Mission: Photo reconnaissance indicated that this mission and Mission # 281 destroyed almost 100% of the plant. Five A/C sighted visually and 90 by radar. Ten A/C were non-effective. Two Wind-Run A/C also bombed the Primary. Twenty-seven E/A sighted did not attack. Flak was medium and heavy, meager, inaccurate to accurate, with S/L cone over the target. Generally barrage type, with some predicted concentration. One B-29 was damaged by AA. Average bomb load: 20,648 lbs. Average fuel reserve: 941 gallons. Fourteen B-29s landed at Iwo Jima. (Mission 322) During the night of 9-10 August, 95 315th BW B-29's bomb the Nippon Oil Refinery at Amagasaki; two B-29's bomb alternate targets. Type of Bombs and Fuzes: M30, 100# and M57, 250# G.P. bombs with non-delay tails. Tons of Bombs Dropped: 953.9 tons on Primary and 3.2 tons on Opportunity. Resumé of Mission: Results were unobserved. Nine A/C were non-effective. Only 2 B-29s slighted visually. No E/A sighted. Heavy, meager and inaccurate flak encountered at targets. Thirteen B-29s landed at Iwo Jima. Average bomb load: 15,338 lbs. Average fuel reserve: 1,345 gallons. (Mission 328) In the longest nonstop upstaged B-29 mission from the Marianas (3,650 miles), 132 B-29's bomb the Nippon Oil Company at Tsuchizaki. Photos of the mission boards for the last mission flown by the 315th in the war.